But what happens next, after you identified who your happy customers are? How do you drive customer loyalty? Even if you don’t actively cooperate with your happy customers, they will, on average, tell nine other people about their experiences with your company (according to American Express). Imagine, how much you could achieve if you actually worked with your promoters! Before you start “promoting to your promoters”, decide on your strategy and needs. There are four main ways how you could involve promoters in growth strategy with different outcomes at the end. Let’s go deeper in each of them. Understanding the reasons why your promoters love your product is one of the easiest, yet most often forgotten ways to benefit from them. If you collect Net Promoter Score (or other customer experience metric) in the right way, this information is already available to you. How? People often forget that customer experience is not a number. The most precious information you can get from customer feedback is actually the text feedback that will help you to shape your business strategy. Find out what parts of your business your customers enjoy the most and share it with the new audiences. Most likely, new customers will also enjoy features/services that please your happiest customers. You might start to wonder "how to do this kind of analysis?”. Many businesses use complex excel files and the help of data scientists to extract the trends behind customer experience. However, if you want to complete it quickly and cost-effectively, there’re modern tools (like Lumoa) to help you. That's an example dashboard of impact drivers. Now you know that most customers are happy about your central location! Referrals generally drive new sales leads, and these leads are much more likely to respond/register/buy your product compared to the cold outreach - the people, who have never heard about you before. Many companies have adopted referral programs. For example, Skillshare offers free premium time for both the referrer and their friend. "Refer a friend” is highly promoted on their website and this is what you’ll see if you want to refer Skillshare to someone. Dropbox introduced a similar strategy of offering free storage space for referrals and the program is driving at least 35% of the company’s daily signups. Dropbox explains how referrals skyrocketed their business faster than any paid advertising in the slides below. Selling more products and add-ons to your existing happy customers helps you to increase the customer lifetime value or CLV. Upsell is often associated with negative “pushy" type of sales, however, it doesn’t have to (and shouldn’t be) that way. 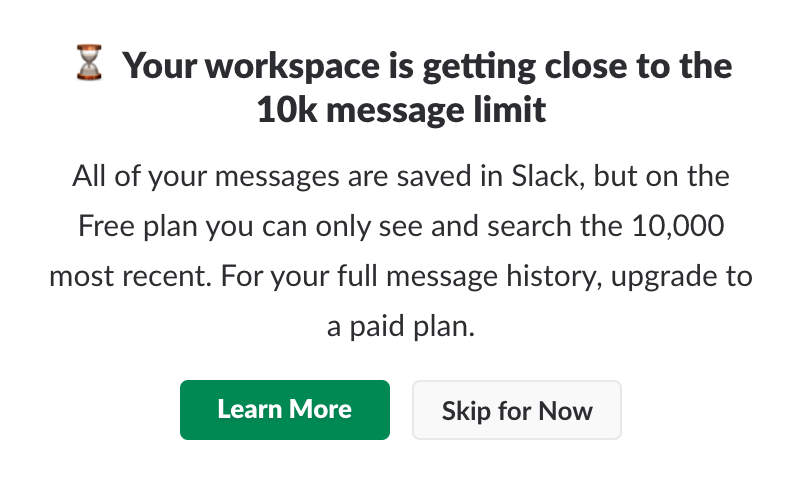 Check this example: Slack suggests users to choose a paid plan by offering value in the right moment. The key is not to sell things your customers don’t need, but actually, find a need and offer your customers more value. And the best part? The probability of selling to a new prospect is 5-20%. The probability of selling to an existing customer is 60-70% according to Marketing Metrics. Upselling is a common practice in many industries, one particular example being the low-cost air travel. Have you ever paid for additional luggage space, travel insurance or onboard catering? Before we continue, take a look at these two restaurants. Which one are you more likely to choose? If you chose the one on the right, you stand together with more than 90% of online customers, who rely on reviews to make buying decisions. Now that you see the importance of reviews, how can you actually drive online reviews? To start with, it’s important to define your preferred channel. For restaurants, it might be Facebook, for hospitals it might be Google, for SaaS companies it’s often Capterra or ProductHunt. The choice of the channel is a crucial strategic decision and largely depends on your target audience. 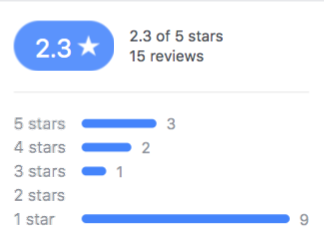 Now you have to remember, that customers who have had a bad experience are two to three times more likely to write an angry review than customers who have had a great experience are to post a happy review. That means that often your online reviews might be worse than what you actually get from surveying your customers. Thus, you should encourage your promoters to leave a positive review. We do it by directing promoters to the external review pages right after they shared the feedback directly with us. Many businesses also offer different kinds of incentives or simply promote the channel of their choice and ask for reviews by email. It’s important to understand that you could (and should) combine any of the four methods above. Find new opportunities and let your brand advocates share and spread their love. After all, it’s a win-win for both. Older PostCustomer Experience, Whose Business Is It?